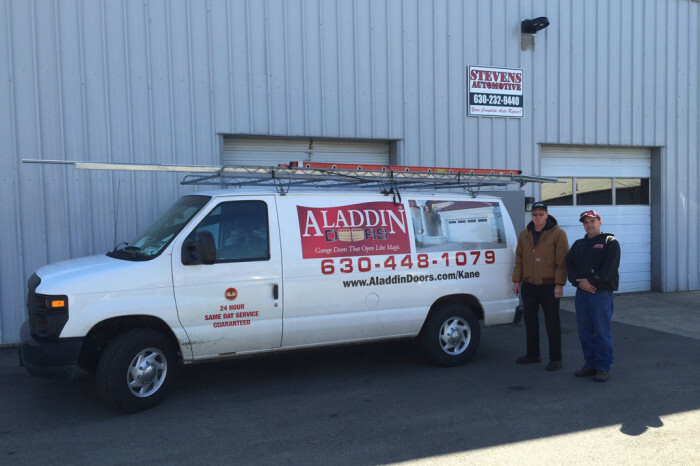 At Aladdin Doors®, we’re passionate about satisfying our customers, growing our business, making money and having fun—and we’re not alone. The garage door has become a hot new design statement for American homeowners who want the latest in style, safety, and high-tech function. At Aladdin Doors® our most valuable asset is our people, we believe that because of them we are in business and with this in mind we will continue and grow our business. Our franchise program is comprised of a magical brand name, high standards, ease of operation, web based management software, on site sales system and much more. Access to the latest garage door technology including the state of the art electronic opener devices adds even more excitement. The vision for our Aladdin Doors® franchise program is to become an industry leader in quick, high quality, and comprehensive garage door services. We’re confident our magical brand will keep growing as long as we continue to embrace innovation and technology and exceed our customers’ expectations. Quit searching for other business opportunities. 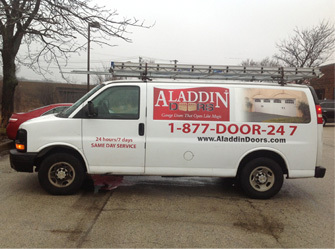 Let Aladdin Doors® grant your wish for a new career direction! A. 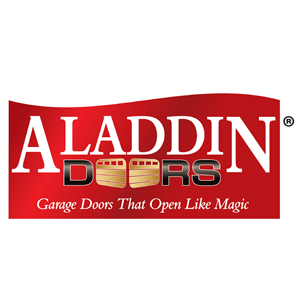 Brand Advantage – Our unique name and tagline says it all: “Aladdin Doors®: Garage Doors That Open Like Magic”. Over the years we have built a reputation for excellence and integrity making doors across the country ‘open like magic’ as evident in our growing family of customers and staggering five-star reviews. 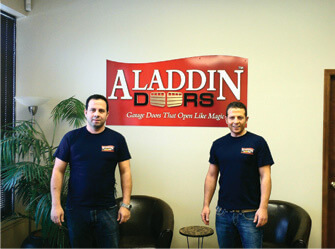 At Aladdin Doors® you can be your own genie; no magic lamp required. B. 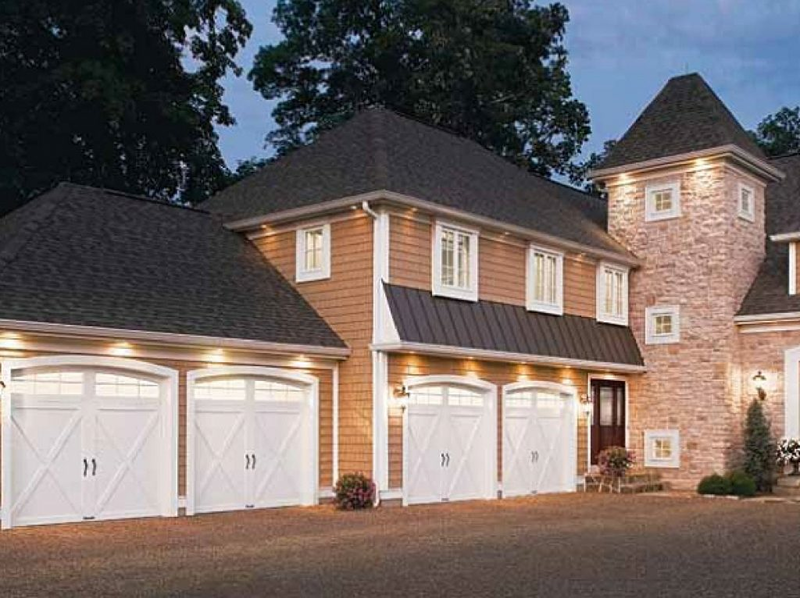 Product Advantage – Access to a wide inventory of garage doors, parts, and accessories: As a master dealer, Aladdin Doors® has established solid working relationships with an extensive array of the top manufacturers and vendors in the industry, to meet your customers’ needs and tastes. 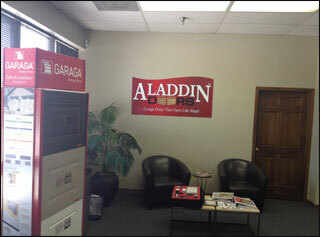 C. Team Advantage – You will be operating your Aladdin Doors® franchise for yourself but you will never be by yourself. 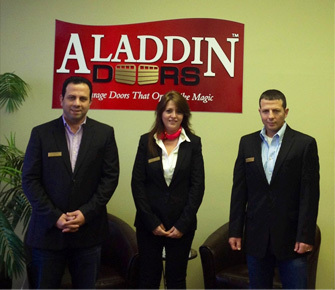 You will have a team of Aladdin Doors®experts backing you up each step of your way helping your business to flourish. D. Low Investment – You can start an Aladdin Doors® franchise as a home-based business, just as we did, later growing into light industrial space for more display and storage possibilities. 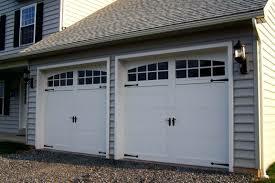 E. Industry Advantage – Since most residential and many commercial buildings have some kind of garage that is used multiple times a day, there will be a perpetual need for professional – not DIY — garage door service and replacement. 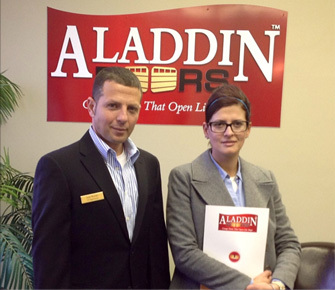 F. Support Advantage – As the owner of an Aladdin Doors® franchise, you can expect to receive first-rate support from our management team.